The term 'infectious waste disposal' covers many different types of clinical waste, from bodily fluids to used sharps disposal and swabs or pharmaceuticals. The business types that will require this service are also very varied such as dentists, doctors, hospitals, vets, funeral directors and tattooists; as all may deal with clinical hazardous waste on a daily basis. Understanding infectious waste disposal and what it means for your business can be a lot to take in; especially when you get stuck into the detail of EWC codes, government legislation, bin / container varieties for each waste type and destruction methods of incineration, recycling or treated. We've got years of experience in infectious waste management, from convenient hazardous waste collection through to ethical disposal, so you can rely on us to ensure that you have everything you need to be legally compliant; all at an affordable price. Infectious Waste (EWC 18-01-03) also referred to as clinical waste is often found in healthcare establishments such as health clinics, hospitals, doctors surgeries, residential and nursing homes, and veterinary practices. Although it often extends and is also disposed of by other non-healthcare businesses such as funeral directors and tattoo parlours. 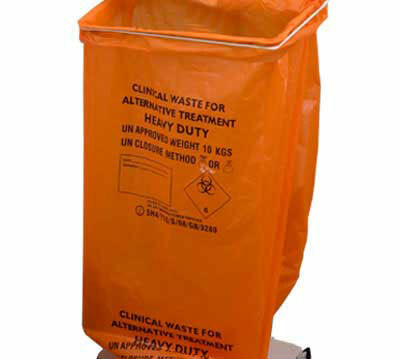 Different types of Infectious waste fall under different categories, and it can often be a little confusing knowing what colour bag or receptacle you need for your business. More often than not, your business will have a mixture of hazardous waste which requires different bins and disposal methods by law. It is important to segregate your Infectious waste under HTM 07-01 guidelines.